Welcome to our NEW in 2019 cocktail menu! We can now offer high-end luxury cocktails as well as more budget-friendly (but still delightful) offerings all at carefully calculated prices. In place of a rigid, packaged budget (our previous GOLD package), we have a flexible cocktail menu that allows you to customize your experience and maintain your budget. Each one of these cocktails has been field-tested and is something we are proud to serve your guests. Craft Event Bar has made a name for itself through impeccably constructed high-quality cocktails. Our focus on preparing cocktails specifically for rapid service at large events has inspired us to develop innovative techniques based on the latest trends in craft mixology. We hand-make the vast majority of our cocktail ingredients, producing perfectly balanced drinks at a reasonable price. As a result, we offer a polished cocktail experience like no other. This elegant sparkling cocktail is little more than a floral improvement on Italian Prosecco; we add light flavor to crisp prosecco with 100% cranberry juice, handmade triple-sec, and just a breath of rose water. This cocktail is still served in a glass decanter adorned with velvety roses. Perfect prior to a wedding ceremony! Made with soft wines and fresh fruit, as well as brandy and natural honey. It’s a fitting ode to hot summer days. Garnish with a spritz of rose or orange zest. This cocktail requires intensive preparation of (pasteurized) egg-washed French cognac and Cabernet Sauvignon, to which we add just a touch of fresh-squeezed lemon juice before we keg and carbonate. Chilled and on tap, this delightfully pink sparkling cocktail is poured over a spritz of atomized rose water. Our handmade Ginger Beer packs a punch, even before we add spirits! Using a macerating juicer, we juice and then filter fresh ginger and mix it with fresh-squeezed lime juice, natural honey, and water; then we carbonate the whole batch for a perfect sparkle. We tweak our handmade Ginger Beer with a touch of Luxardo cherry syrup, and then add wheat vodka and carbonate the keg for a bright and perfectly balanced Moscow Mule. Garnished with atomized lime zest. Our Ginger Beer stars again in this cocktail, now blended with Kentucky Bourbon and custom bitters for a smooth, rich depth of flavor that only bourbon can impart. And just because that ginger beer is SO good, we’ve featured it here with Dark Rum for a sweet and rich addition to our ginger beer cocktails. It’s got a dash of custom bitters, poured through chilled lines, and topped with atomized orange zest. As refreshing as a state fair lemon shake-up, with all the added joy of a martini; our Lemon Drop is made with citrus vodka, fresh clarified lemon juice, refined sugar syrup, and topped with atomized lemon zest. This Cosmo is cold, undiluted, and lusciously fruity. Made with citrus vodka, handmade triple-sec, fresh clarified sweet lime juice, and 100% cranberry juice. Finished with atomized orange zest for a delightful sweet citrus nose. We very carefully infuse vodka with cracked-pepper, celery seed, and fresh horseradish before we blend it with organic tomato juice, fresh-squeezed lemon juice, Worcestershire sauce, and select bitters. Our Bloody Mary is spicy and rich without being chunky. Served through chilled taps with an olive. This fair-weather cocktail is made with some of the usual suspects: vodka, tequila, two kinds of rum, and handmade triple-sec, but we round it out with lemon, honey, and cold-brewed iced tea for a drink that you’ll truly treasure on a hot summer day. London dry gin and Kentucky bourbon blend remarkably well when sweetened ever so slightly with honey and fresh-squeezed lemon juice, hence the name. We pour this through chilled lines and garnish with aromatic lemon. The Waterlily is our drink for undercover gin lovers. We blend London dry gin with equal parts Giffard’s Créme de Violet, handmade triple-sec and fresh-squeezed lemon juice. This balanced representation of floral flavor is tempered by herbaceous gin and brightened with citrus, including a garnish of atomized lemon zest extract. We call this the ‘cocktail for professionals’. The Negroni holds no punches: Equal Parts Gin, Campari, and Cocchi Sweet Vermouth with just a touch of custom bitters. Poured through chilled lines and topped with atomized orange zest. It’s a mouthful of sweetly decadent herbal character that only these spirits can provide. If you’re a pro, serve this over hand-cut 2-inch ice cubes; amateurs, however, may enjoy a little more dilution, if they can take it at all. Once you’ve had a real margarita, you’ll never be the same. It’s bright citrus on a hot day: 100% blue agave tequila, hand-made triple sec, and fresh-squeezed sweetened lime juice with a dash of custom bitters. Garnished with atomized orange zest, optional salt rim. The sweet acidity of tropical pineapple shines in this cocktail: platinum tequila, handmade triple-sec, organic pineapple juice, and fresh-squeezed lime juice are mixed with a few dashes of salt and custom bitters for the perfect balance of flavor. Served through chilled taps, optional cayenne salt rim. Hugh Kelly was once experimenting with his Triple-sec recipe and happened to make an orange syrup so good, we designed an entirely new drink around it. The inspiration itself is a reduction of orange juice, zest and sugar, spiced with bitters and vanilla, which we temper with water and Captain Morgan’s Spiced Rum. Then we carbonate the keg and serve this beauty through cold taps. This sweet-bright blend of white rum, simple syrup, and fresh-squeezed clarified lime juice is kegged ahead of your event. Then, your bartender makes a show of muddling fresh leaves of Thai basil in LIQUID NITROGEN* before shaking into your daiquiri to ensure a vivid green herbal essence to this flashy cocktail! *Liquid Nitrogen can be extremely dangerous when used in uncontrolled conditions. We are aware of these dangers, and always mindful of safety; we never float it on the surface of cocktails, muddle too vigorously, or add it to any drink prior to complete dispersal. Your guests will NOT be exposed to liquid nitrogen in their cocktail. A true Craft Event Bar original, this is a bright, fruity, and delectably sweet Piña Colada-inspired cocktail with the special-event upgrade of Italian Prosecco. We combine light rum with Diplomático Aged Rum, filtered organic pineapple juice, fresh-squeezed orange and lime juices and our handmade sweet almond orgeat. 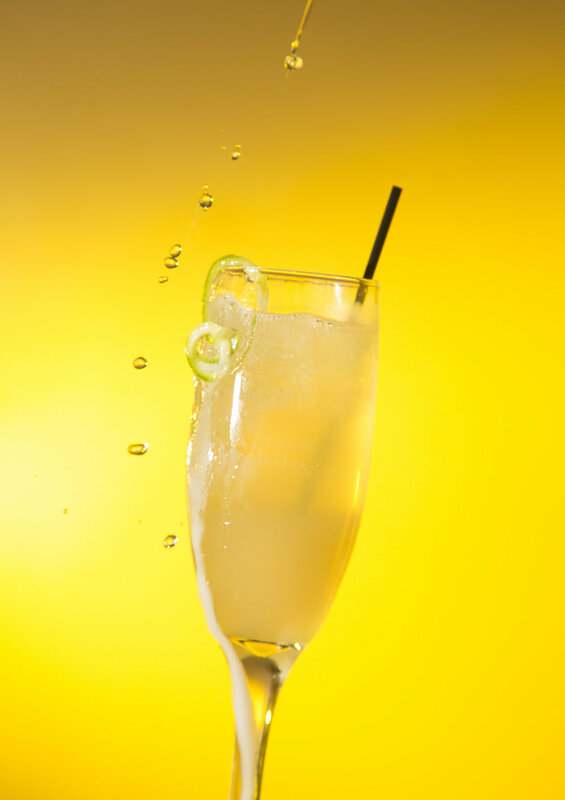 At your event, we pour this cocktail through our chilled lines over ice and top with a sparkle of Italian Prosecco. The Old-Fashioned is a time-honored technique for taming American bourbon; We very gently add Luxardo cherry syrup, fresh orange juice and custom bitters to do the trick, plus turbinado simple syrup. Garnished with a Luxardo cherry. This drink is a personal favorite, and destined for the menu of our latest bar project. It is a simple but delectable mix of barrel-aged Knob Creek bourbon with Luxardo Amaretto and just a touch of clarified lemon juice for acidity. Then we carbonate this mix for a dancing flavor reminiscent of Cherry Coke. We serve it through chilled taps over ice with a Luxardo cherry. So good. We don’t mess around with this classic: two parts Kentucky bourbon, one part Dolin Sweet Vermouth, and a special blend of aromatic bitters. Chilled on tap, garnished with a Luxardo cherry. So simple and so perfect, this is just the kind of cocktail we love. Rye whiskey gets finessed with the sweet tartness of fresh-squeezed grapefruit juice and grenadine with hopped grapefruit bitters for depth. What hours will your bar be open?